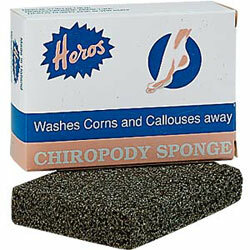 The Heros Chiropody Sponge, made in Holland, will prove to be the best foot scrubber you will ever use! Scrub off the dead skin on your feet and hand with this amazing piece of porous material is actually a pure raw glass product to which carbon and hydrogen sulphide is added during the manufacturing process. You're sure to save lots of money on those expensive pedicures. This is a must try for summer or anytime of year! This is the only thing I've tried that actually works! I used to buy these in a local pharmacy which closed so I went online and was very happy to find them here. I wish they were more available in this country as they actually solve the problem at a reasonable price. Follow instructions exactly for excellent results after the first use.